Located just seven kilometres east of the Sydney CBD and home to a number of breathtaking natural attractions, Waverley offers the perfect blend of city and sea living. It is also known for its built attractions – particularly in the suburb of Bondi Junction, where consumers can choose from a wide variety of top tier commercial outlets, entertainment facilities and restaurants, in addition to first-class living accommodations. From shopping in trendy stores to relaxing on beautiful beaches, Waverley truly has something for everyone. Considering everything it has to offer, it is no surprise to learn that the local government area (LGA) of Waverley is one of New South Wales’ most visited destinations. In fact, its world famous Bondi Beach is one of the most visited tourist sites in the country, and the most visited in the state behind Sydney Opera House and Sydney Harbour Bridge. Bondi Beach averages 2.5 million visitors each year – a number that spiked to 3.5 million in 2014. Bondi Beach enjoys an international brand that draws in tourists from across the globe. 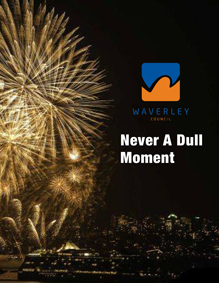 Waverley Council has done an excellent job leveraging that brand to offer a complete tourist experience that extends well beyond lounging around on its world-famous beach. For example, visitors can partake in the ‘Bondi to Coogee Walk,’ a picturesque six-kilometre cliff top coastal walk that is one of the most popular activities for locals and tourists alike. They can also visit the historic Waverley Cemetery located in Bronte atop the cliffs overlooking the ocean, which has been open for nearly 140 years and contains the graves of many prominent Australians. Moreover, tourists can participate in a long list of exciting and renowned events. That list includes: The Festival of the Winds kite flying festival, which is regarded as “Sydney’s most colourful spring festival”; Sculptures by the Sea, the country’s largest annual outdoor sculpture exhibition, which uses Bondi Beach as a beautiful backdrop; and City2Surf, a popular 14-kilometre fun run that draws more than 80,000 entrants each year. 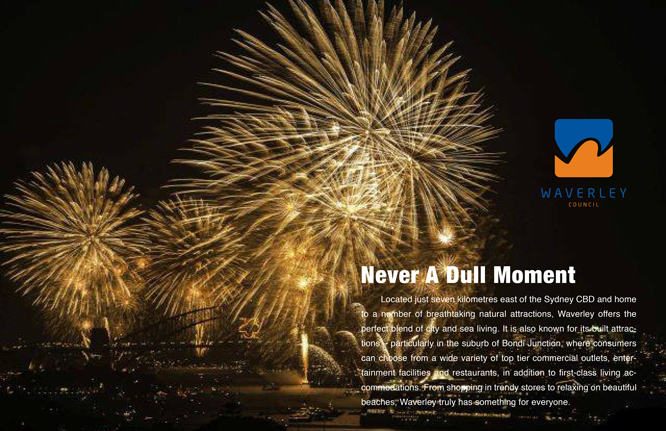 That list also includes Bondi Winter Magic, an event that showcases Waverley’s year-round appeal. Bondi Winter Magic features a beachside ice rink – the only one of its kind in Australia – as well as live music and art displays on the streets. Waverley’s vibrant cultural scene, however, is only one of the many reasons it ranks among the top LGAs in the country in both visitation and population density. The area’s diverse offering has attracted an equally diverse community of nearly 70,000 residents in just nine square kilometres. According to Peter Monks, Director of Waverley Futures, those residents have come from all over the world to live in Waverley because its world-famous beauty is matched by its dynamic cultural scene. Additionally, Waverley is home to a wide range of health and medical facilities, which is fast becoming a major feature of the LGA. Two years ago, Waverley Council established its first ever Economic Development Unit to help facilitate sustainable long-term economic growth throughout the LGA. That unit has since prepared the Waverley Economic Development Strategy: a five-year plan outlining several key targets Council aims to achieve by the year 2020. One major target addressed in the strategy is the strengthening of Council’s relationships with its stakeholders, chiefly the Bondi Chamber of Commerce. Council now holds quarterly business forums with the chamber, giving Council valuable insight and feedback on ways it could help stimulate mutually-beneficial economic growth. Case in point, Council is currently reviewing its bureaucratic processes to improve efficiency internally, particularly in obtaining approvals for outdoor events. “There are a couple of things that we’re trying to do to just ease up the red tape-side of our operations to make it easier for businesses to get off the ground,” notes Peter. The prudence of building a close relationship with the chamber cannot be overstressed, as Bondi Junction accounts for a whopping 55 per cent of all retail turnover in the Eastern Suburbs of Sydney. Much of that turnover can be traced back to Westfield Bondi Junction, a mammoth upscale shopping centre featuring 499 stores and services across 126,895 square metres of total retail floor area. Westfield Bondi Junction attracts about 59,000 people a day, which equates to nearly 22 million visits each year. Bondi Junction also features the first ever Williams-Sonoma, Pottery Barn and Pottery Barn Kids stores to be owned and operated by American retailer Williams-Sonoma outside of North America. Peter says that the retailer chose Bondi Junction for the first step of its global expansion strategy on account of the centre’s strong market recognition, as determined by online sales. Even more, Pacific Bondi Beach will soon be opened to the public, further adding to Bondi Junction’s already dynamic retail scene. The mixed-use development will offer state-of-the-art residential units coupled with top-of-the-line shopping outlets, entertainment facilities, restaurants and hotel accommodations. “That in itself will be one of the most significant attractions that people will make use of as they come to Bondi Beach,” says Peter. Pacific Bondi Beach is just one of a few residential developments currently underway at Bondi Junction. Peter says that there are another three being built at the moment that are set to yield roughly 1,000 apartments, and they have received applications for another five or six major developments nearby. However, Council is carefully managing the influx of new residential developments to ensure that the infrastructure can accommodate the growth in population. Council is also currently conducting feasibility studies exploring the possibility of bringing in additional hotel accommodations to Bondi Junction to cater to the growing number of visitors. Currently, only about 100,000 out of the three million or so visitors to the region each year stay overnight, and Council is hopeful that the addition of a five-star hotel might encourage more visitors to extend their stay in Waverley instead of just visiting for the day. With great foresight, Waverley Council purchased a number of properties throughout Bondi Junction well before a number of upper class developments transformed the suburb into one of the premium destinations in New South Wales. Many of them are investment properties used to generate funds to provide additional services to the community, whilst others are currently under consideration for repurposing as part of Council’s Bondi Junction Civic Heart project. “That project follows our Bondi Junction Vision for 2030 work that we did with the community, where we rebranded Bondi Junction as the heartbeat of the east, being the area’s major economic strategic centre,” says Peter. Council has allocated $60 million for the Civic Heart project, which is still in the planning stages. As part of the project, they are looking at how to best utilise a series of buildings they own on a particular street block. Many of those buildings are heritage-listed properties whilst others are in need of maintenance and repair. Council is considering a variety of options for those properties. One is to potentially consolidate the council chamber – which is currently spread out across 14 separate buildings – into a handful of properties along that street block. Another is to convert them into entertainment facilities such as late night dining restaurants and public galleries, or to even use the real estate to bring in five-star hotel accommodation. In recent years, Council has also completed a plan of management for Bondi Beach, Bondi Park and Bondi Pavilion. The first stage of that plan was delivered around Christmas of last year and involved improvements to the facilities and amenities at Bondi Park. The next stage of that plan involves the $37 million refurbishment of the “much-beloved” Bondi Pavilion: a building with great community sentiment, but one that currently doesn’t provide much value on account of its significant maintenance costs. Another area of focus for Waverley Council is the Bondi Junction Bus-Train interchange. At the moment, the interchange’s train component is lacking in terms of accessibility, and Council is working on a plan to potentially install escalators that take passengers directly off the train station’s platforms straight to Oxford Street Mall, which would be of great benefit to both passengers and nearby businesses. In addition to the plethora of development projects, upgrade works and economic strategies listed above, Waverley Council is also focusing its efforts towards promoting a pristine natural environment. Peter says that Sally Betts, Mayor of Waverley Council, is particularly passionate about this cause and has been a driving force behind Waverley’s “very strong environmental agenda.” Council has also enjoyed universal support amongst its elected members in addressing the issue, regardless of their individual party affiliations. Waverley Council is currently rolling out Environmental Action Plan 3, which has been in place since 2012 and will remain in effect until 2020. The plan features a number of ambitious environmental targets that many other councils have been reluctant to set for themselves, including: a 30 per cent reduction in greenhouse gas emissions by 2020 and a 70 per cent reduction by 2050 based on 2003 levels; a no net increase of waste generation using the 2004/2005 baseline; 75 per cent resource recovery of commercial and residential waste by 2020; a zero increase in water consumption by 2020; and much more. Looking ahead beyond Environmental Action Plan 3, Council has initiated its Green Infrastructure Master Plan to deliver improved energy, waste and water systems to all new and existing buildings in Bondi Junction. “We’re working towards transforming Bondi Junction into a hub of environmental innovation complete with efficient buildings, low carbon energy, recycled water and integrated waste and recycled systems as part of the Bondi Junction 2030 Vision,” reads a statement on Waverley Council’s website. The master plan features a number of innovative solutions to increase the efficiency of its systems, particularly in regards to waste collection. For example, one solution explores the possibility of implementing a pneumatic waste system that would carry waste through an underground network of pipes to a waste centre, where it would be sorted and dealt with in the most sustainable way possible. Council is currently working with business owners to determine the feasibility of such a system, which has only been attempted once before in Australia and has yet to be completed. The Green Infrastructure Master Plan also looks at alternative energy systems – namely cogeneration and trigeneration plants, which would be used in place of coal-based electricity to reduce greenhouse gas emissions. “These ideas are quite different and a bit speculative, but we are prepared to think outside of the box and be quite ambitious and innovative in trying to find solutions to some of these issues,” says Peter. Council has received tremendous support from all of the partners involved with the master plan, which include the Bondi Chamber of Commerce, property developers, local businesses and large private groups such as Westfield. In fact, Westfield is Waverley Council’s joint partner for the Green Infrastructure Master Plan – an important relationship considering they own and operate the biggest retail site in Bondi Junction, so both parties have a mutual interest in ensuring a good outcome. 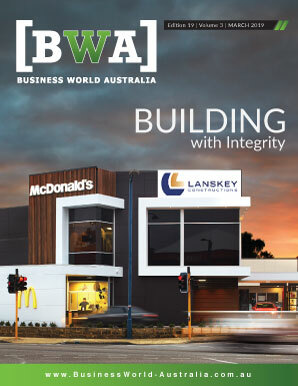 Waverley Council has also launched the Building Futures Partnership in conjunction with property owners, industry groups, utilities, government and independent experts. Like the Green Infrastructure Master Plan, the Building Futures Partnership is centred around improving the efficiency of energy, waste and water systems in new and existing buildings in Bondi Junction to help achieve Council’s commendable environmental targets. Moving forward, Waverley Council is confident that the environmental initiatives they have in place will bring about positive, long-lasting changes that will serve the LGA well into the future. Even if Waverley Council is amalgamated as a result of nationwide local government consolidation, Peter says that its current members will take solace in knowing that they “have left a very good legacy” that future governments could benefit from.